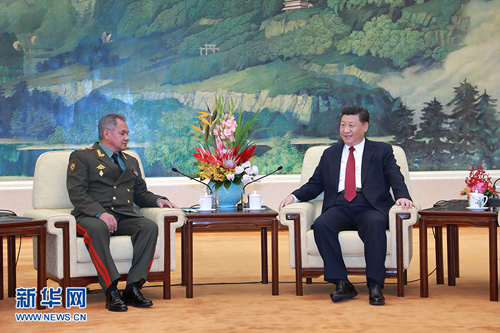 BEIJING, Oct. 19, Chinese President Xi Jinping on Friday met with visiting Russian Defense Minister Sergei Shoigu in Beijing. Shoigu conveyed Russian President Vladimir Putin's cordial greetings to Xi while Xi expressed his thanks and asked Shoigu to convey his sincere greetings and good wishes to Putin. Xi said that China-Russia relations have continued to maintain a high level of development and political mutual trust has reached its highest level since the beginning of this year. "I have met with President Putin three times in the past five months, which embodies the high level of the China-Russia relationship and its distinctiveness," Xi said. Noting that both sides value each other as their most important strategic partner of coordination and their diplomatic priority, Xi said China-Russia cooperation in various fields is fruitful and the two countries coordinate and cooperate closely with each other in international affairs, and have become a key factor and constructive force to promote world peace and stability, setting an example of major-country relations and neighborhood interaction. Stating that 2019 will mark the 70th anniversary of China-Russia diplomatic ties, Xi said the Chinese side will work together with the Russian side to take this opportunity to strengthen comprehensive coordination and mutual support, and promote China-Russia comprehensive strategic partnership of coordination to a new level, so as to better benefit the two peoples. Xi said military ties between the two countries are an important symbol of their high-level and distinctive bilateral relations and the highlights and important support of the strategic cooperation. Xi said, cooperation between the two militaries has been deepened continuously and positive achievements have been made in areas including joint drills, real combat training and military competition in recent years. Xi said he hoped that "both militaries can work to deal with common security threats, create a benign external environment for their respective state development and national rejuvenation, continue to improve cooperation, and provide a solid foundation for the development of China-Russia comprehensive strategic partnership of coordination." China and Russia should unswervingly deepen their strategic coordination, jointly become a bedrock for stabilizing international order and defend well their respective and common interests, Xi said. "We firmly believe that the international moral high ground and the trend of the times are on the side of peace-loving countries and people." On his part, Shoigu said the strategic leadership of President Xi and President Putin is an important foundation for deepening Russia-China comprehensive strategic partnership of coordination. Putin attaches great importance to developing bilateral military ties and spoke highly of coordination and cooperation between the two militaries in the recent Vostok-2018 (or East-2018) strategic drills, he said. The Russian side is willing to work together with the Chinese side to continuously strengthen the strategic coordination, further improve military cooperation, jointly enhance their abilities to tackle all kinds of security challenges, and contribute to safeguarding the common interests of the two countries and international and regional peace and stability, Shoigu said. Zhang Youxia, vice chairman of the Central Military Commission, also attended the meeting.